We are dedicated to putting geography back on the map in primary schools. So every weekday you will find, via these teacher resources pages and our social media channels on Twitter and Facebook, a new geography-themed photo challenge. This will include a photo as stimulus and a challenge question or activity. The challenges have been designed to be used with your Interactive Whiteboard without any extra resourcing or planning required (anything to lighten your workload!) and work perfectly as either registration work or a lesson starter/plenary. Your students will be developing their geography skills and you can decide whether to use the challenge as a prompt for written work or paired/group/whole class discussions to help apply literacy skills across the curriculum. There is a different theme every day so use the links below or on the left if you want to follow a theme for a longer lesson or series of lessons. #mapMonday – A focus on map skills which will get children talking, exploring, honing their skills and increasing their knowledge. You may wish to have atlases or Oddizzi at the ready for added depth of learning! #whatifWednesday – Wednesdays are linked to our other FREE resources – the What if…? Challenge packs. The #whatifWednesday photo challenge can be used as a standalone resource or you could delve deeper using full pack to give children the opportunity to achieve mastery in geography by answering open-ended questions based on a scenario. Look out for the What if…? Challenge each Wednesday and download your FREE teacher pack to get everything you need including printable answer sheets for pupils. #travelThursday – Explore the world with travel Thursday which looks at new places and how we get there. A combination of places and transport sure to spark some interesting discussions and maybe even some travel plans! 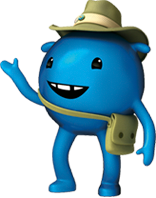 Have atlases and globes at the ready alongside your Oddizzi log in to enhance children’s geography research skills. #findoutFriday – Fridays will be a real mix of interesting inquiry based questions. They may include prompts for fieldwork in your local area and/or research questions which could easily extend into great family homework for the weekend. An ideal way for curious minds to end the week!